← What will I cook tonight? Well you see the result of my culinary endeavours- Mediterranean combinations. I went to the supermarket on my way home. I wanted mackerel, but the mackerel fillets looked very tired in appearance. There were some whole mackerel. “Great”, I thought. So I brought them home and started right away.My knife needed to be sharpened but I managed. Then I opened out the fish and removed the guts and then the bones. Having a small kitchen I needed to be careful that bits of fish did not go everywhere. I’m not sure I fully succeeded! 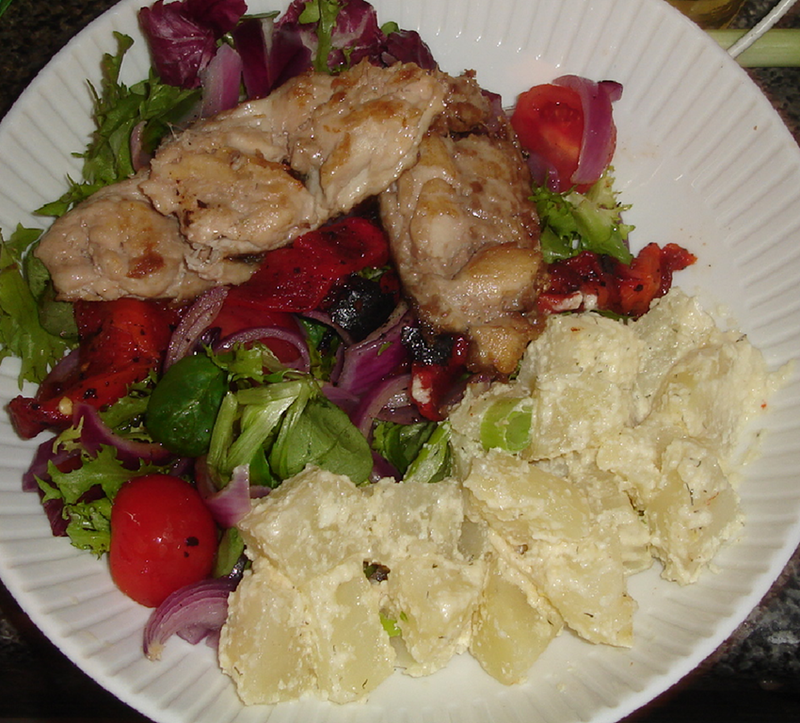 I made a warm potato salad to cut the oiliness of the mackerel. I am not a great fan of bought mayonnaise so I make a homemade salad cream to dress the potato salad. It consists of half a clove of garlic, cooked white of an egg, a teaspoon of Dijon mustard, a few teaspoons olive oil, a little milk or whipping cream and some salt. Whizz these ingredients together in a mini blender until it is consistency of whipping cream and pour over warm potatoes cut into cubes. A firm waxy potato seems to work best. I also had a simple lettuce salad- with roasted peppers, red onions (slightly blanched) and tomatoes. This had a dressing of olive oil and balsamic vinegar. I am content now, having an adequate sufficiency. Tidying the kitchen and washing the dishes will keep until the morning. My cooking task for lunch is a tomato tarte tatin using the recipe by Lorraine Pascale. Should should an icon of French patisserie be tampered with? You will see tomorrow so please return to my blog and find. Wish me luck! I fancy a strong espresso now and a chocolate biscuit despite the lateness of the hour. I’m exhausted, in retrospect something simpler would have been easier to prepare, but the results have more than compensated. Have a go yourself. The combinations work superbly well together.